I have to admit, while I had not had any experience working in this contest, I have heard about it read the rules/etc. Cary VE4EA was drumming up local support for more turn-out to this contest. I did read about it in the last NCJ that it would no longer be a supported contest from their perspective. The indication was poor turn-out in the last number of years. A band of hams got together to keep it going and they were pushing for participation — so I decided, why not – I’ll try something new. Well, it was new for sure! One has to remember the ability of their station (and the operator) to work a contest under various conditions. I still consider myself a n00b in the contest scene and still get my feet wet where I can — this was a rather ‘interesting’ contest. 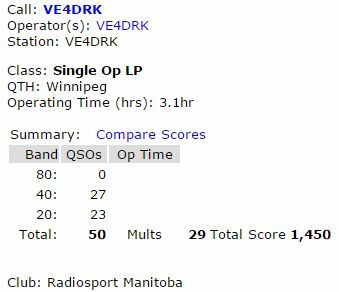 Another local ham, fairly new to the HF/contesting scene, Dan VE4DPR also participated — I worked both Cary and Dan on at least one band during the contest. I can say for the first while it went along fine – and I was able to S&P and get responses when I was calling CQ — then about half-way through the contest, it became more interesting. Seems I could not finagle a contact through a pile-up — and given that I only had one crack at it, until the next station came on, it was all or nothing. I lost a few contacts when either they faded or adjacent QRM caused too much interference to complete the entry — remember I do run a rather old basic radio, a TS450SAT on a G5RV and a vertical. The contest was also categorized as QRP/LOW/HIGH power … I’m not sure how the QRP stations would have made out with the high power stations. It appears to be a fun contest for those with decent station setup and certainly if you’re running power – you can charge right in and get the contact. So, as you know, I’m looking to increase the antenna count for my station — and have picked up a fan dipole to try out for better receive — will see how well it performs once it warms up a bit (I don’t like to climb the house at-40c).